In this paper, a fluorescent method was developed for ochratoxin A (OTA) detection that uses iron-doped porous carbon (MPC) and aptamer-functionalized nitrogen-doped graphene quantum dots (NGQDs-Apt) as probes. In this method, the adsorbance of the NGQDs-Apt on the MPC due to a π–π interaction between the aptamer and the MPC results in the quenching of the fluorescence of the NGQDs-Apt. 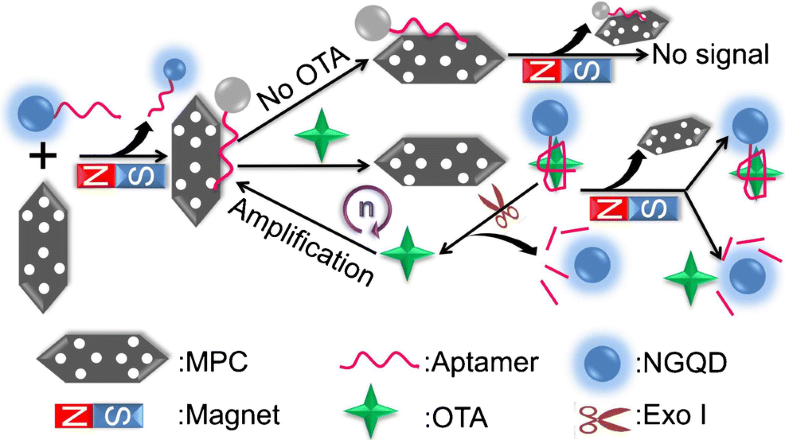 However, since OTA interacts strongly with the aptamer, the presence of OTA leads to the detachment of the NGQDs-Apt from the MPC, resulting in the resumption of fluorescence from the NGQDs-Apt. When exonuclease I (Exo I) is also added to the solution, this exonuclease specifically digests the aptamer, leading to the release of the OTA back into the solution. This free OTA then interacts with another MPC–NGQDs-Apt system, inducing the release of more NGQDs into the solution, which enhances the fluorescent intensity compared to that of the system with no Exo I. Utilizing this behavior of OTA in the presence of NGQDs-Apt, it was possible to detect concentrations of OTA ranging from 10 to 5000 nM, with a limit of detection of 2.28 nM. Our method was tested by applying it to the detection of OTA in wheat and corn samples. This method has four advantages: (1) the magnetic porous carbon is easy to prepare, its porosity enhances its loading capacity for NGQDs, it highly efficiently quenches the fluorescence of the NGQDs, and its magnetic properties facilitate the separation of the MPC from other species in solution; (2) applying double magnetic separation decreases the background signal; (3) Exo I digests the free aptamer effectively, which allows the resulting free OTA to induce the release of more NGQDs-Apt, ultimately enhancing the fluorescent signal; and (4) the proposed method presented high sensitivity and a wide linear detection range. 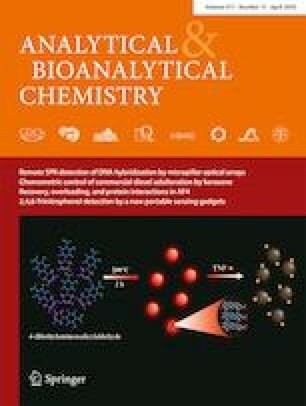 This method may prove helpful in food safety analysis and new biosensor development (achieved by using different aptamer sequences to that used in the present work). The online version of this article ( https://doi.org/10.1007/s00216-019-01684-7) contains supplementary material, which is available to authorized users. This study was funded by the National Natural Science Foundation of China (no. 21305032), the China Postdoctoral Science Foundation (no. 2014 M551522), Jiangsu Planned Projects for Postdoctoral Research Funds (no. 1402073B), and Hong Kong Scholar Program (no. XJ2017008).